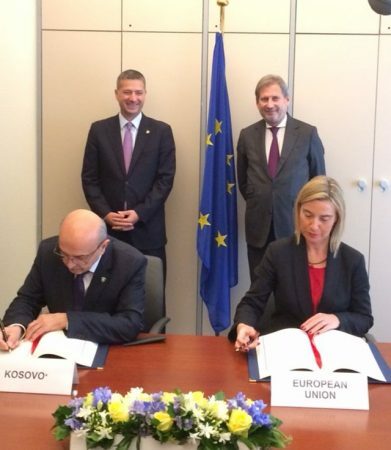 The Stabilization and Association Agreement (SAA) between Kosovo and the European Union will be effective as of April 1 2016. Authorities in Kosovo say that this agreement is the culmination of all the efforts and commitment that institutions of Kosovo have shown during the past decade and a half. Minister of European Integration Bekim Collaku says that SAA offers a new start which speeds up the process of European integration. “As of April 1 2016, the fate of Kosovo and the European Union will be tied closer than ever before and this will be a good thing for both sides. This is why this year and in the years to come, we must work a lot in implementing this program. The application of SAA in the first three years will give way to Kosovo’s application for EU membership candidacy,” Collaku said. According to him, this agreement has three main objectives: to meet the political criteria, deliver the economic reforms in integrating Kosovo’s market in the EU and the incorporation of EU standards in all the domains of governance.